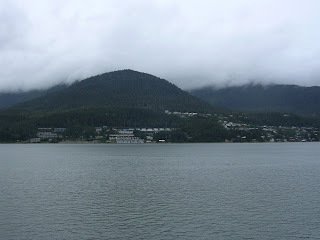 Grey and Loving It: Ya Havta See Alaska! 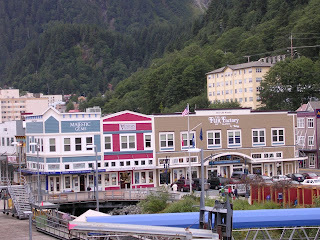 The first place we visited on our cruise to Alaska was Juneau, the State Capital. It is a very commercial port with thousands of tourists, so naturally the thing to do is shop, and that is what we did. Mom and I purchased a cut glass window hanging that has the mountains in the background, than glaciers and a cruise ship. 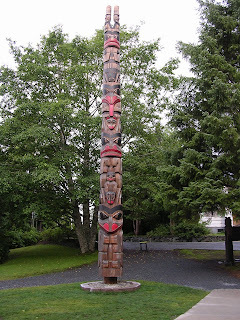 There is a totem pole on the left side. We really like it. 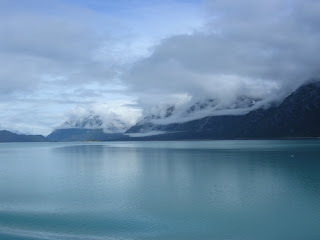 After we left Juneau we traveled north to Glacier Bay. The weather was beautiful and the water as calm as you see in the picture on the left. 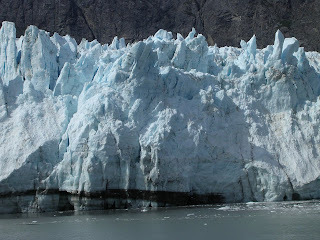 We saw many glaciers, and had a great time watching the glacier in the picture on the right calve several times. When in does it sounds like thunder. It was amazing! As you can see I haven't figured out how to get my words below or beside each picture, so you will have to hunt around to match up pictures with the story. 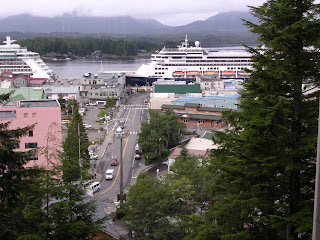 We went from Glacier Bay (my favorite place) to Sitka (my next favorite place). 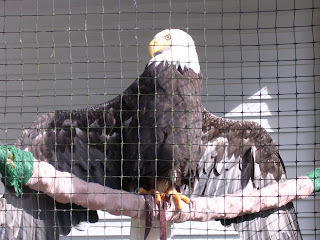 There we spent over four hours walking around, taking pictures and visiting a national interpretive center for the Tlingit People and then an Eagle and Falcon Raptor Center. 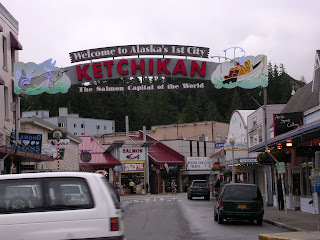 We traveled next to Ketchikan, "The Salmon Capital of Alaska." 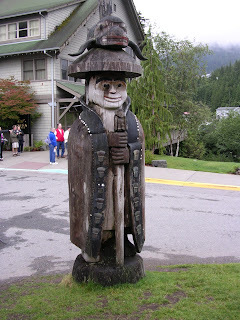 It has more totem poles than any other city. 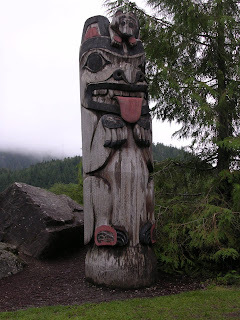 We rode the Fanicular up to the top of the hill that overlooks the City-more totems! Our last stop before returning to Seattle was Beautiful Victoria, B.C. Unfortunately we didn't arrive there until 7pm, so we did not want to try and do much. Krista and I did decide to go off the ship and find a grocery store and stock up on good old Canadian junk food. We even purchase a McKane's(sp?) Deep and Delicious chocolate cake. Krista bought the most stuff so she could share it with her friends in Seattle. While we cruised we had lots of fun aboard ship, eating, playing Trivia Challenge, going to the Art Auctions, eating, getting our picture taken, eating- you get the picture. Mom gained 4 pounds and I gained 6! At the Art Auctions Mom won a picture and Krista won four! We arrived back in Seattle on Friday Aug 14. Greg was there to pick us up. Thanks again Greg! It was a great trip, and I recommend it to everyone.